Another day, another round of movie promotions. 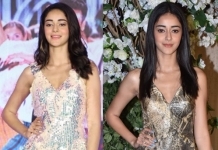 And this time around, Shraddha picked a dress by Pink Porcupines to wear. With her hair pulled back in to a braided ponytail, she rounded out the look with Black Balloon jewelry and her trusty black ankle-strap sandals. Not. Big fan of the dress, but she looks nice, l like that she is never overdressed, with OTT jewelry.